They are some very impressive numbers – where to start? In the preview I stated that the 2014 mauling Kerry inflicted was on the back of a trend that saw Cork’s attack differential go from +4 in 2012 to -7 in 2013 & finally -16 in 2014. Cork didn’t quite get back on par here but what they did do was break even in the possession stakes. Again the last three years showed that they had the forwards to finish – they just needed the ball. The qualities of the Cork forwards were evident in their first two goals. Mark O’Sé had gotten the better of C O’Neill in the early exchanges but the tables were turned for the first goal. Below are some images clipped just before the goal where O’Neill drifts out to the right and then digs hard to get in behind O’Sé – wonderful movement. The second goal had wonderful movement of a different stripe. Fitzgerald has O’Connor bang to rights on the wing but O’Connor drives past him and then fights, ignoring the jersey tug, to get in front. After that lung busting battle h then has the presence of mind to deftly lob Kealy with the fisted goal. From a Kerry perspective both instances show up a defence that leaked quite a few goals during the league – neither defender was able to hold the attacker in one on ones that seemed, initially, well marshalled. What of the Kerry forwards? The big difference between how both teams amassed the high weightings was the number of players involved. Cork only had six players contributing to their 15 shots. Kerry on the other hand had 12 players taking a shot with none of them attempting more than two. Seven players attempted just the one shot – with five converting. That is some spread of accuracy. O’Donoghue continues on his merry way. In four games across four years against Cork he has converted a truly remarkable 94% (15 from 16) of point attempts. He absolutely loves playing Cork. The Gooch? He only had the one attempt from the left of the D which he converted – after receiving a peach of a pass in space and into the bread basket – from M O Sé. Perhaps his most telling contribution was in the build up to the third goal. There was an interesting conversation on Off The Ball last week about whether a team could afford the luxury of a non “dropping back” half forward and that even the Gooch would have to do his duty. For Cork’s 3rd goal he was in the line to stop Shields but didn’t really impede him. Positive day all round but that will ultimately be overshadowed by what happened at the end. Both 45s were central (Sector 5) with a conversion Rate of 50%. So we could have expected an average intercounty player to convert one of them. C O’Neill & J O’Donoghue are no average players though … both missing was probably the outsider of the 4 combinations. History doesn’t tell us much unfortunately. I have 9 Cork games in the database with two O’Neill 45s; both were central and he converted one – as per the expected return. He was on a good day (4/4 from frees and 1-02 from 5 attempts from play up until then) so was entitled to have a go. D O’Connor had gone off the pitch at that stage but if he was still on I wonder would he have taken it? Again unfortunately I only have two 45s recorded from him – he converted both but they were back in 2012. Similarly for O’Donoghue I only have the one 45 in the database (which he missed) although he did miss a relatively straight forward free in the corresponding game last year. Again Kerry’s principal deadball proponent was off the pitch; I have four instances of Brian Sheehan taking a 45 with him converting …… 50%! What it all goes to show is the absolute luxury Dublin have in Cluxton. And if he is so rock steady what does it say of Rock that he has taken over the duties (to date)? In the 2014 Munster final Cork never went short. They smacked the ball c55-70m and let the likes of Sheehan, Buckley, Walsh & Maher dismantle their game. They were much more nuanced here understanding the importance of primary possession. Although they won their own kickout 17 – 5 what will be really pleasing is that the short kickout did not dominate. When the ball went past the 45 – and the kickout became contestable – they won the possession battle 11 – 5. On top of that when Kerry kicked the ball past the 45 Cork broke even winning 5 of the ten. Kerry’s kickout stats, unlike Cork, are padded by the 6 short kickout. Rather than a game of two halves this was a conspicuously loose first 15 minutes followed by some of the most controlled play you are likely to see. That first 15 minutes had 19 turnovers – they remaining ~60 minutes (taking in injury time) had a combined 20. Kerry are past masters at defending through holding the ball. Here they went ~25 minutes – from the 15th to the 38th on the clock plus first half injury time – coughing up the ball only once. That is just phenomenal ball control. Note; some post game tidying up. I charted Fionn Fitzgerald’s last point as a shot. There has been some debate over whether he meant it but my initial gut reaction was that he did. Also Colm O’Neill had a free on the left wing towards the end which I did not chart as a shot. Again my gut reaction was that taking the free with the left, from the left sideline – and looking where the ball landed – he was trying to drop it near the square (which he did getting a 45 from the scramble). I missed the fact that Goulding was on the field for the final 45. He converted a number of 45s in the 2010 final as well as having 3 from 3 in the database (2012 – 2014). Cork’s attacking play disintegrated last year. They managed a full 16 less attacks than Kerry did however this was the tipping point of a trend (if 3 games can be considered a trend!) rather than a one off. And something they need to rectify this Sunday. The difference in attacks over the three years was Cork +4, Cork -7 & Cork -16. 2014’s defeat, whilst comprehensive, was not completely unexpected when compared to 2013. Yes Cork only lost by two points in 2013 but their shooting was sublime that day converting 65% of their shots and only leaving Kerry’s 45 without a shot on four occasions. They couldn’t repeat the trick in 2014. Last year they converted 88% of their attacks to shots but their attack volume was so low that average shooting only produced 12 points. On 26 attacks an average team will score 0-10 or 1-09 … to get the 17 points that Cork achieved in 2012 and 2013, off average shooting, they will need 42 attacks. Assuming they maintain a high Shot Rate (in the mid 80 percentile) then off average shooting they need 39 attacks. If they get the best of both worlds – a high Shot Rate and a high Conversion Rate (60%) – they still need 33 attacks. Sunday *has* to be about primary possession and transference of that possession into the 45. They have proved over the three years that they can manufacture shots when they attack and that their shooting is above average. They just need the ball. Of course what would help immensely are goals. Or even one goal. In the last three games Cork have only manufactured 8 goal shots and returned a paltry 0 – 03. I say *only* as for comparison (unfair) Dublin managed 8 attempts at goal against Kildare scoring 4 – 01 whilst (fair?) combined Dublin & Kerry managed 9 in two games against the vaunted Donegal defence. Cork were better in 2014 as they managed four attempts but they all came in the last ~15 minutes when the game was over. Even with four missed goal shots in the numbers Cork’s 2014 shooting from play was abysmal; 33% going for a point (4 from 12) with a combined weighting of -1.335. They’ll need to rediscover the shooting boots from ’12 & ’13 to win on Sunday. Nothing about where Cork are shooting from stands out hugely except perhaps that they are just average when shooting from the wings. Against the big teams this can be a productive area as they mind the square – think Flynn against Donegal in last year’s AI semi final. If Cork are going to continue taking 67% (32 of 48 attempts) of their point attempts from between the 20 & 45m then they’ll have to convert more from the wings. Kerry’s attacking play has improved year on year with a step up in every metric (attacks, Shot Rate, Success Rate & weighting) from ’12 to ’13 to ’14. Much like Cork if there was one area of concern for Kerry (concern is a bit strong – an area that needs polishing) it would be their goal taking. In the three games they’ve taken 10 shots at goal but scored only 1 – 02. Their point taking in 2014 was phenomenal (67% Success Rate with a weighting of +5.313) however prior to that it was average. So what was the difference? Yes O’Donoghue had a huge bearing but the rest of the team stepped up as well. Now undoubtedly they were getting more space (a) due to O’Donoghue and (b) due to the nature of the game compared to ’12 & ’13 but as a collective they still outperformed the two previous years. Something for Cork to note perhaps when they review the 2014 tape. As for O’Donoghue? He has been incredible against Cork converting 93% (!!) of his point attempts over the three years. Below is his shot chart from ’13 & ’14 (the ’12 version has gone awol) showing how close into goal he has played. I stated above that one area Kerry might look to polish up on was goal shots – there is a second. Their deadball shooting has been average over the past three games scoring 0-14 from 21 attempts (67% conversion Rate). If Cork can keep it close, and increase the pressure on the free taking, this may just be an area that will let Kerry down on Sunday. Dublin will be very pleased with their day’s work but if Galvin wanted to nit-pick on something over the coming months it could be that this facile victory was built upon a second half when the game was done. In that second half their shooting returns were 12 of 15 (80%) with a weighting of +3.127. They were not clinical enough in the first half – against a better team they may find themselves in a hole with such finishing. Still they *did* score 1-21. The above is cribbing for the sake of cribbing. Cork on the other hand won’t be searching too hard for bulletin board material throughout the Summer. They had low shot volumes with poor execution but this all stemmed from the very low volume of attacks they had (28 to Dublin’s 43). Although they had enough ball to be in the game they were wholly unable to use it. Cork only managed to get every other possession (53% in total) into the opposition’s 45. Dublin pressed hard up high which stifled Cork’s ability to move the ball. This was encapsulated in a little snippet around the 16th minute in the first half. About 30m out Brady hand passed a ball to McManamon but as the ball arrived McManamon slipped. Instead of lamenting his bad luck Brady chased down Cadogan, who had picked up the ball, and pressured the ensuing pass. Cadogan kicked the ball straight over the sideline – a Cork turnover, and possible counter attack, was snuffed out before it had even begun. Perhaps the most surprising return from the game was that Dublin only managed one shot at goal from play – when Jack McCaffrey hit the post in the second half. In 2013 25% of all their shots were at goal. The new conservative Dublin or just a one off? The most disappointing aspect of the day was Cork’s exceptionally poor shooting. Hurley & O’Neill are two of the best marksmen in the game but they were 1 from 5 on the day. Daniel Goulding missed three as well for good measure. As a whole Cork only had nine point attempts from play converting one. Although the shooting was undoubtedly affected by the limited volume Cork’s problems were not solely limited to moving the ball up the pitch. A good day all round with only Cluxton’s very long range free and Hayes’ last kick of the ball missing the target. Although O’Neill converted two less than Rock his weighting comes in higher due to the nature of the frees both attempted. Only two of Rock’s seven frees came from the wings whilst O’Neill converted three from the wings – including a 45. Rock’s volume basically made up for O’Neill’s difficulty. Dublin lorded their own kickouts winning 93% (13 from 14). Cork were also strong on their own kickout – winning 77% (24 from 31) but this drops to 65% when the short kickouts are removed. That in itself is not bad but the high volume of short kickouts is somewhat padding the stats. Cork have been very fond of the short kickout in the past two games – 40% of the 57 kickouts dropped short of the 45 – it will be interesting to see if they persist with this method throughout the year and whether that continues into them struggling to get attacks off against better teams. In the game of percentages Cork won easily. They had a higher Shot Rate and an excellent Success Rate – the problem was that Mayo’s volume of attacking possessions was just so large that no excellence in shooting could bridge the gap. That’s not to say that some of Mayo’s shooting was not excellent. It was – especially towards the end with Vaughan’s point under pressure & O’Connor’s free from the right with the right foot. But generally speaking Mayo had the volume of shots whereas Cork had the accuracy. That volume of attacks is a huge step up on what Mayo have produced this year (41 against Galway & 36 against Roscommon). Even in the hammerings they dispensed in last year’s Championship to Galway (x36 attacks), London (x46) and Donegal (x49) they never breached 50. Some will argue that part of that volume can be attributed to the Cork system which, with two deep lying sweepers in the first half, invited Mayo to carry the ball to the 45 however this does not entirely explain it – indeed the half splits were 24 attacks in the first half and 26 in the second. The next table however goes some way to explain just how Mayo had so many attacks. Mayo manufactured 12 extra possessions from outside their 65m line. By sitting back and not pressuring Mayo Cork only really collected the ball inside their own 45. Mayo on the other hand manufactured easy attacks by receiving the ball in prime positions time and again. 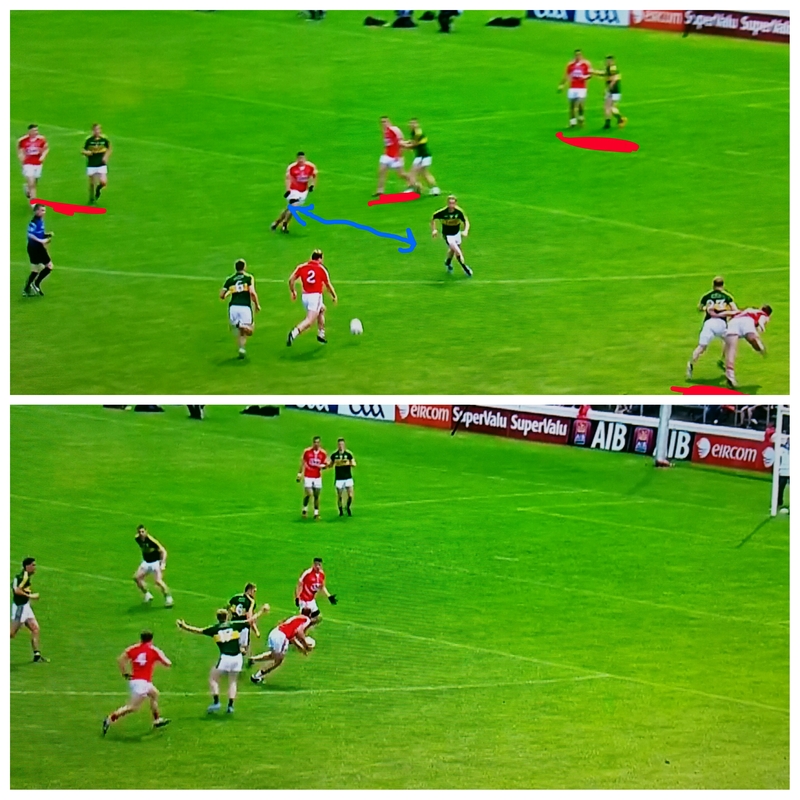 Given how well Cork were shooting it was gaining these easy attacks that was the difference maker. 35 shots from play is up there with Dublin’s returns (34 v Laois, 37 v Wexford & a ridiculous 41 v Meath) whilst a Success Rate of 49% is healthy. The one aspect of this that might concern James Horan and his backroom team is how relatively few goal shots there were. In total they went for goal three times in this game which followed on the four attempts in the Galway game and zero against Roscommon. 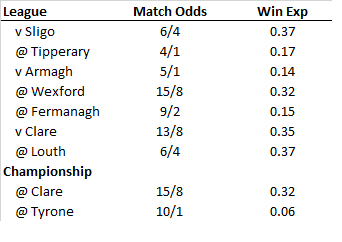 For the three games in which they have been featured on TV Mayo are running at a goal shot every 9.29 point attempts. Dublin are running at a goal shot for every 4.09 attempts at a point. Of interest is the fact that Mayo only converted 14% (1 from 7) of their shots from the right between the 20 & 45m line. There was no one culprit with six different players missing from that area. In the previous two games their Success Rate from this sector was 38% (5 from 13) – which is about bang on average. It would appear to be “one of those things” but definitely something to keep an eye on in the semi final. As a contrast Cork converted three of their four attempts from the same area but the fact that they had 16 shots for a point, as opposed to Mayo’s 32, just emphasises the problems they had manufacturing scores. Despite their excellent returns from the right one thing that is evident on the shot charts below is how infrequently Cork were able to get a shot off from in front of goal beyond the 20m line. Mayo had eleven shots from this productive central area – Cork had three. All round solid displays without anyone being spectacular. We have seen a trend towards longer attempts at goal this year (Beggan, Morgan & Murphy spring to mind) and Cork had three attempts from outside the 45 in this game. Walsh was successful with one mammoth free but missed a second whilst O’Neill also missed one from beyond the 45. One from three is about par but given the general excellence of Cork deadball striking over the years this is an area they would have hoped to gain an advantage from – over the three games they were on TV this year their Success Rate from long range frees was 38% (3 from 8) with a weighting of -0.4977. 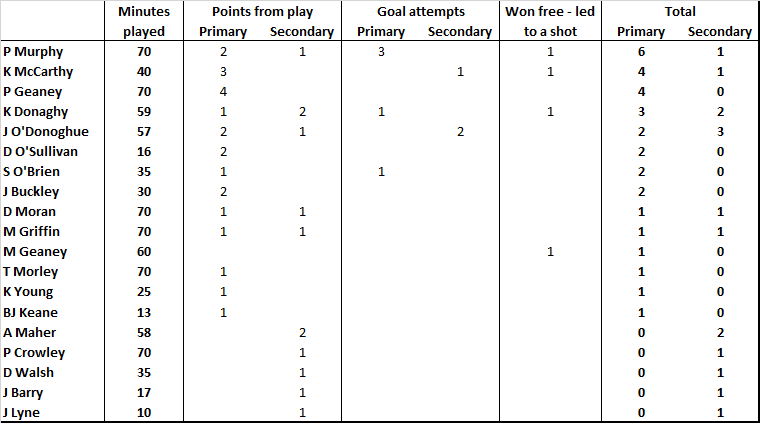 One thing to note is that Mayo only won four frees within shooting range (3 points from O’Connor and one that was quickly taken to Vaughan for a fisted point). In their two previous games against Galway & Roscommon they won 6 & 7 respectively so it is not something they will dwell on but credit should be given to the Cork backs for their discipline in marking the Mayo forward line. 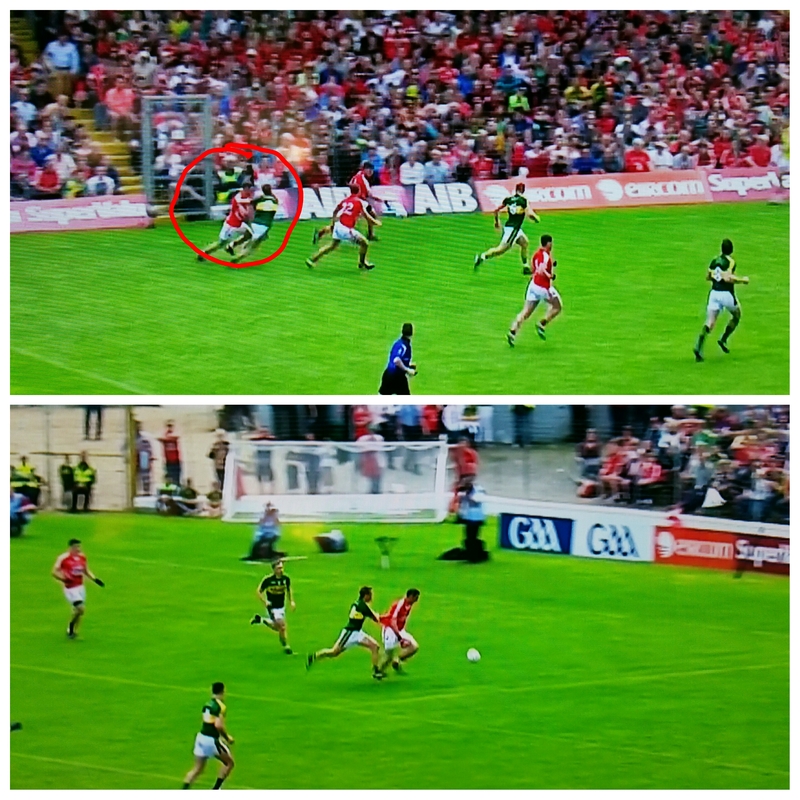 O’Neill shows up well here for Cork – I had him winning five of the six frees Cork attempted inside the 45. Incidentally Tom Cunniffe gave away three of these fouls with Cafferkey (x2) & Keegan being the other culprits. Mayo were able to transition 70% of the turnovers they manufactured (or received!) into shots. On such a high volume of turnovers that is a remarkable percentage. Of course what helped them to maintain such a high percentage was where they won their turnovers. 9 of the 30 were won inside Cork’s 65 with Mayo getting a shot from all nine and scoring 1-05. Nine turnovers that high up the pitch is a phenomenal number. Mayo got 5 such turnovers against Roscommon and four against Galway whilst the highest Dublin have managed this year is 7 (V Meath). Those turnovers are Class A counter attack possessions and Mayo were clinical in how they dispatched them. I define winning a kickout as being the first team to gain possession of the ball – in that respect Cork did not do too badly. Yes they had five more kickouts than Mayo but if you gave Cork essential parity – in terms of shots generated from kickout possessions – prior to the game I think they would have taken it. Of course whilst the raw numbers here seem to show Cork acquitting themselves adequately they did have trouble on their own kickouts. We have seen that Mayo pressed very effectively in Cork’s half and the fact that Cork were willing to go short so often to protect possession enabled them to do this. Cork may have gotten their hands on the ball first (on 16 of 17 short kickouts) but often times they did so under extreme pressure (Doherty robbing Kelly & Cadogan having a hand pass intercepted spring to mind). When they did kick past the 45 it became much more of a contest with Cork winning the possession battle 9-7 on the remaining 16 kickouts. But again of those nine wins seven were done so with a Mayo man contesting the kickout. Mayo won 77% of their own kickouts but the remarkable thing about this is that they only went short three times. Whereas Cork won 56% of their own kickout that landed beyond the 45 Mayo won a hugely impressive 74%. As a complete aside the fact that Mayo were having such dominance on contested kickouts is a reason why I would have attempted to manufacture a goal attempt with that last free. Granted Cork won the previous Mayo kickout – and A O’Shea was off the pitch – but Cork must have had a <40% chance of gaining possession from that kickout. Alan Dillon had a very productive day only missing on one of his five attempts for a point whilst his other miss was a shot at goal from very close range attempted when O’Halloran was on top of him. A stunning performance from Kerry no matter the metric. Outstanding accuracy on a very high Shot Rate from a large base of attacking possessions. You could not ask for more. Whilst both teams have lost a large number of household names from last year Cork’s inability to get attacking possession here is a carryover from the 2013 Munster Final. That day they had 30 attacking possessions (to Kerry’s 37) but had a phenomenal Success Rate of 65% that got them back into the game. Here there was no repeat of that shooting accuracy and the paucity of attacking ball told for their chances pretty quickly. Indeed the metrics may actually hide just how poor Cork were. Excluding the last 10 minutes, when Kerry arguably let up (I present Cork gaining possession on their last 8 kickouts as evidence!) their possession total was 20. In the Dublin – Laois game it was noted that “It will be an exceptional shooting performance that tops what we witnessed” when commenting on Ross Munnelly’s performance. At the time he had topped anything we had seen in 2013 – O’Donoghue’s day was another leap above that. O’Donoghue recorded an 80% Success Rate on 10 shots with a weighting of +2.967 – and one of his misses was an attempt at goal. He therefore had an 89% Success Rate when going for points. Ridiculous. He was ably supported by Geaney & Buckley who combined for a Success Rate of 70% on 10 shots with a combined weighting of +2.564. Three players combining for 0-15 from play from 20 shots. The average would be 0-09. If you wanted to find something to gripe about then the fact that they didn’t convert any of their four goal shots could be one area. But you would really be stretching for a gripe. Another area that may be of concern is the lack of pressure that Cork placed on the forwards – could this performance be reproduced? Of their 27 shots for a point 17 were taken under no pressure – 63% in total. Kerry converted 11 of these for a Success Rate of 65%. Of those taken under pressure 70% were converted (7 out of 10). No real difference in terms of conversion rates and nothing that could be gleaned regarding future games. Prior to the Championship I wrote about how Kerry would struggle to replace the quality of Cooper’s returns (here). I was reminded during the week of the Ewing concept articulated by Bill Simmons – essentially how other players step up and show themselves to be better than previously thought when a leader is injured. Step 1 for Kerry well and truly accomplished. Cork’s numbers look terrible from an accuracy stand point and it could be argued that this is driven in the main by desperate attempts for goal at the end of the game. After 60 minutes however their weighting was -0.957 on (a paltry) 11 shots. Their radar was missing from early doors. About the only positive you could take from this game, from a Cork perspective, was Goulding’s deadball striking. Hurley hit 3 from 3 however they were all very central; Goulding on the other hand converted a 45 and a very tight free on the corner of the sideline and 20m line. The impression that one will take from this game, re Kerry’s deadball striking, is Bryan Sheehan’s effortless 45 & the ridiculous free from the sideline on the 13m line. However the overall returns paint a different picture. On top of those two sublime efforts were two misses one of which was on top of the D.
The full set of numbers, over 70 minutes, do not reflect the dominance that Kerry had in this area nor the apparent lack of alternative strategies that Cork seemed to possess. Kerry lost 8 of their kickouts to Cork but two were in the first three minutes whilst three were at the end in the last 10 minutes. For the 60 minutes in between Kerry won 7 of their own 10 kickouts gaining 0-05 points to Cork’s 0-01. Cork do not appear to have performed too badly on their own kickout however their performance was bookended by winning 8 of their first 10 and also their last 8 when the game was gone. Whilst the game was in the melting pot they lost 11 out of 15. Despite getting cleared out in this period of the game the kickout never really varied – it was kicked c55-70m with a range of about 10m either side of the centre – a nice big rectangle for Sheehan, Buckley, Walsh & Maher to establish base camp. 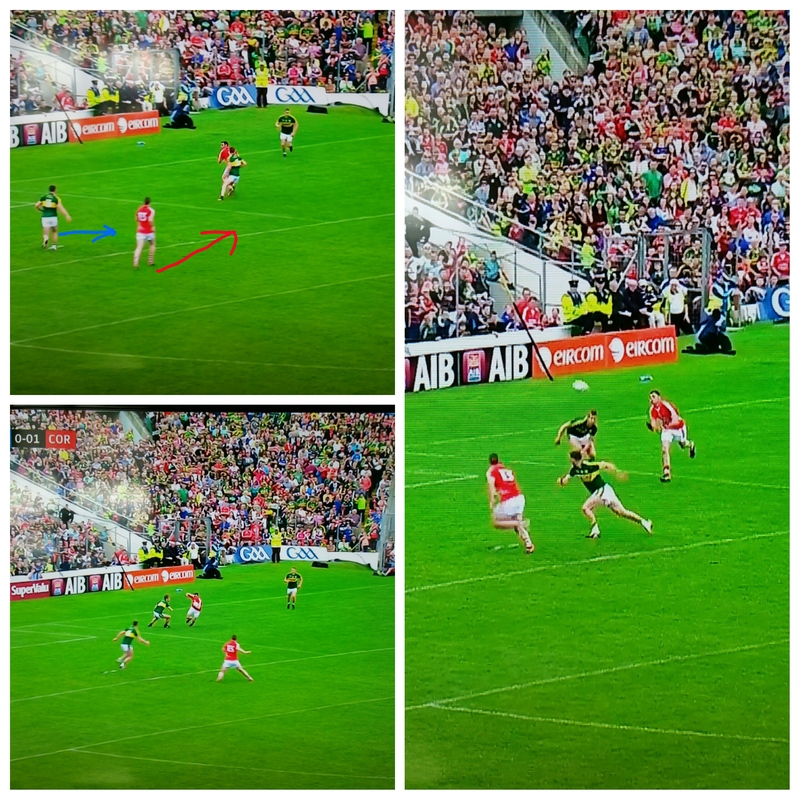 During this phase, either side of half time, Kerry manufactured 9 shots from possessions on Cork kickouts to Cork’s two. What is surprising is that Cork never went short. They did so on one in five of their kickouts in the league game against Kerry and had manufactured two shots from the two short kickouts they had executed prior to this phase (admittedly one of them was taken by Cahalane under severe pressure but it was taken). Very good from Kerry. When they did receive a turnover they converted 73% into a shot which is up there with the best returns we have seen (small sample size granted). But perhaps more impressive was what they did on turnover ball that they forced. One could group “Mishandled” and “fouled ball” with tackles as generally these occur because of the pressure being employed by the opposition. Kerry thus “forced” 11 turnovers and they converted these forced turnovers to a shot 91% of the time (10 from 11). That has got to be hugely demoralising to the opposition. On the other hand Kerry only misplaced 6 passes in the entire game. In the second half they went 31 minutes without misplacing (opposition getting the ball) a pass. Please note that Cork’s second goal is not considered in the below returns. Although it emanated from a Cork shot that shot is deemed to have dropped short rather than the end result being a goal. 44 is the highest number of shots recorded in a game to date. It generally won’t matter what your Shot & Success Rates are if you can totally smother the opposition in shots. As it happens Dublin’s shooting was quite poor converting only 49% of their shots. Cork’s returns were actually average – their shooting was, however slightly, better than Dublin’s – but they just could not deal with the avalanche of attacks. This game was the atypical game of two halves. It was not that Cork were more dominant than Dublin in that first half – they had 23 possessions to Dublin’s 22 – but rather they were more clinical in their shooting. In the second half however Dublin took over with 32 possessions & 28 shots (a Shot Rate of 87.5%). There are teams that would struggle to achieve those numbers in 70 minutes let alone 35. Again we can see that Cork’s radar was more accurate than Dublin’s – Dublin just (!) had an extra eleven shots. Some of Dublin’s starters had quite an off day with A Brogan, McManamon, Connolly & Andrews combining for a very poor stat line of 5 scores from 20 shots (20% Success Rate) with a weighting of -3.803. It was the accuracy of O’Gara, B Brogan & McAauley that ensured the returns were just below average. A quick mention for Brian Hurley as well. Against Kerry he hit 7 scores from 11 shots and was on course to better that here with a first half return of 5 points from 7 shots. I’m not sure what’s more remarkable – the volume of shots or the combined Success Rate of 67% (average = 45%) during that span. Unfortunately for Cork he was starved of the ball in the second half and didn’t manage to get another shot off. Much like the Kerry-Cork game last week the figure that jumps off the page is Dublin only affording Cork two shots at goal, or one for every 17.5 possessions, from free kicks. Dublin won 64% (37 out of 58) of all kickouts gaining 12 extra shots from the possessions won but this really was a case of contrasting fortunes. Dublin had a total of 24 kickouts in the game and won possession on 21 of these (88%). This return is inflated however by the fact that, from afar, Cork appeared to be content to ‘let’ Dublin have the short kickout. This worked initially in that Dublin did not manage to manufacture a shot from the first 5 kickouts that went short but of the next eight short kickouts Dublin got a shot off 6 times. The stat that best shows that Cork’s tactic didn’t work was that from Dublin’s 24 kickouts Dublin managed a shot 12 times; Cork managed two. Cork more or less broke even on their own kickouts winning 18 to Dublin’s 16. This wasn’t enough however considering that the tactic on Dublin’s kickouts wasn’t working.